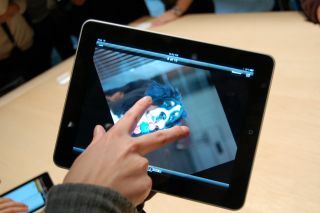 Apple iPad Wi-Fi vs iPad 3G: which is best? Apple iPad Wi-Fi vs iPad 3G: mobile data or MiFi? In the USA, the iPad is a confirmed hit - a million iPads were sold in just a month, boding well for Apple's forecast of selling around ten million units in 2010. After delays due to huge iPad demand in the USA, pre-orders opened in the UK (and eight other countries, including Japan) on May 10, for an official launch tomorrow. Demand in the UK has also been strong, and the delivery date for new pre-orders has slipped twice, once to June 7, and then merely to 'June'. However, your local Apple Stores and DSGi outlets (PC World, Currys, Dixons) have now got stock. Therefore, what you need to do is decide which model to buy-something this article will help with. The two types of iPad are largely identical, each boasting a 9.7-inch LED touchscreen with 1024-by-768-pixel resolution, Wi-Fi (802.11a/b/g/n), Bluetooth 2.1 + EDR technology, a 1 GHz A4 chip, and a chunky battery that lasts up to ten hours when performing tasks such as surfing the web, watching video or listening to music. During testing, we've found that even when playing games, you should still get six hours out of your iPad before it needs recharging. Physically, there are few differences between the iPad Wi-Fi and iPad Wi-Fi + 3G iPad models. The latter is a touch heavier, has a strip of black plastic at the top (ensuring the device gets decent 3G reception-something that wouldn't happen if the entire case was made of metal, like the Wi-Fi iPad), and a micro-SIM slot. In the box, you get a Dock-Connector-to-USB cable and power supply with both models, and a SIM eject tool with the Wi-Fi + 3G iPad. Next Page Apple iPad Wi-Fi vs iPad 3G: mobile data or MiFi?